On Friday, March 2, at 11 a.m., the Pekin Public Library will present the third video in its Illinois Bicentennial Series in the Community Room. The video that will be shown is 34 minutes in length and is entitled, “Farming in Tazewell County During the ’30s and ’40s,” presented by Tom Finson. Like last month’s Finson video, it includes vintage film footage from around the county. Admission is free and the public is invited. For the pioneer settlers of central Illinois, farming wasn’t merely a business, but was crucial for a settler family’s survival. Our column this week recall the first of the post-War of 1812 settlers in our area. The summer before Illinois was admitted as the 21st state of the Union in 1818, a territorial census counted 40,258 souls living in the soon-to-be state – but the new state’s population rapidly increased over the next decade. Up to that time, American settlers in Illinois had come chiefly from southern states and had settled almost exclusively in southern Illinois. But with the dawn of statehood a new wave of migration arrived, in which settlers from southern Illinois began to move north, joined by newcomers from states north of the Ohio River. These new arrivals to central Illinois came up the Illinois River or overland from southern Illinois to Fort Clark (Peoria) and its environs – and as we shall see, these newcomers included William Blanchard and Nathan Dillon, names prominent in early Tazewell County history. As we saw previously, American soldiers built Fort Clark in 1813 on the ruins of the old French village of La Ville de Maillet, which Capt. Thomas Craig had burned the year before during an Illinois militia campaign meant to warn the Indians of Peoria Lake not to ally with Britain during the War of 1812 (but which likely had the opposite effect). Craig’s accusation that the French Americans of Peoria Lake were in league with Indians hostile to the U.S. was based on the fact that the French not only lived peaceably with the tribes of the area, but even sometimes intermarried with them. But the tribes of Peoria Lake had declined to join Tecumseh’s confederacy and were considered to be friendly until the unprovoked attacks of Territorial Gov. Ninian Edwards and Capt. Craig. Chapman’s comments reveal that his disparaging appraisal of the French fur traders was due not only to disdain for the social class and lifestyle of a fur trader, but also the pervasive racist bias against Native Americans that spread westward with American expansion. Other influences included the age-old enmity between England and France that stemmed from the medieval Hundred Year’s War, with religious estrangement and animosity between Protestants and Catholics also thrown into the mix. Those same attitudes toward the Indians and the French were also exhibited by Charles Ballance in his 1870 “History of Peoria.” In his history, Ballance argues at length that the French Americans of La Ville de Maillet were culturally and socially greatly inferior to the Americans of British origin who supplanted them, finding fault with the style of the homes they built and even denying the reports of the village’s former inhabitants that their settlement included a wine cellar and a Catholic church or chapel. Maybe behind Ballance’s common ethnic, racial, and social disdain for the Indians and French, there was an uneasy conscience over the fact that the city of Peoria of Ballance’s day only existed because the French settlement had been wiped out in 1812. The construction of Fort Clark at the site of the French village in 1813 planted the seed of the present city of Peoria, for a new village quickly grew up around the fort (the site is today Liberty Park on the Peoria Riverfront, at Liberty and Water streets). According to Chapman, the fort itself burned down five years later. But in 1819, one year after Illinois statehood, the pioneer founders of Peoria arrived: Joseph Fulton, Abner Eads, William Blanchard (1797-1883), and four other men, who had traveled by keelboat and on horseback. The next few years saw the arrivals of even more settlers. In 1825 the state legislature created Peoria County, which originally covered a large area of central and northern Illinois, including the future Cook County and the soon-to-be formed Tazewell County. 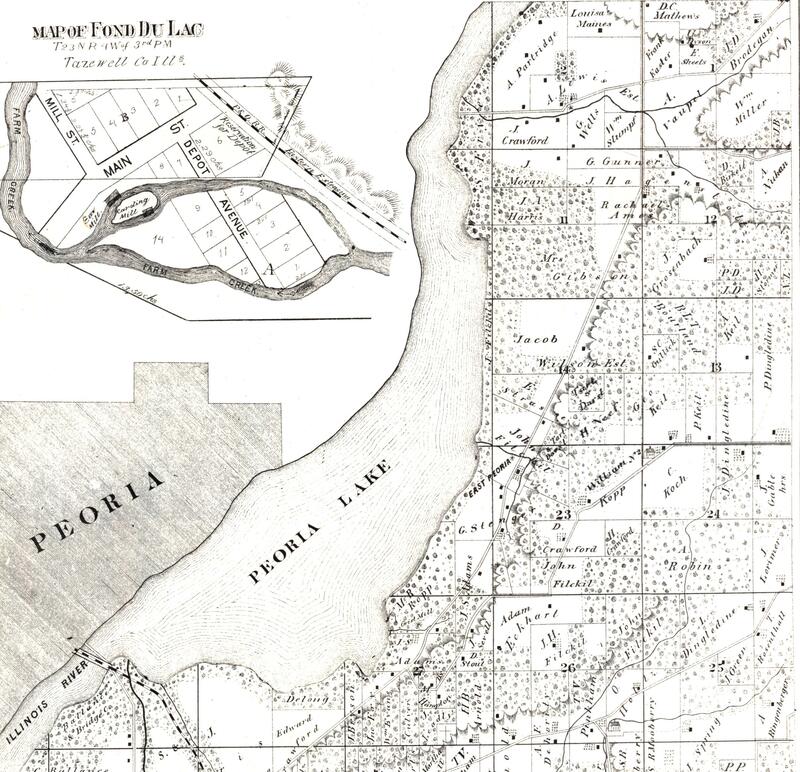 Ten years later, Peoria was officially incorporated as a town, and by 1845 Peoria was large enough to incorporate as a city. “Wm. Blanchard, Jr., is a native of Vermont, where he was born in 1797; left that State when seven years of age, and with his parents went to Washington Co., N. Y., where his father, William, died. When seventeen years of age he enlisted in the regular army, and took an active part in the war of 1812, serving five years, when he, with Charles Sargeant, Theodore Sargeant and David Barnes, veterans of the war, started West, coming to Detroit, Mich., thence to Ft. Wayne, whence they journeyed in a canoe to Vincennes, thence to St. Louis. From there they came up the Illinois in a keel boat manned by a fishing crew, and commanded by a man named Warner, and landed at Ft. Clark, now Peoria, in the spring of 1819.
designated on the map as land owned by “Rachael Ames” — is shown in Sections 11 and 12 of Fondulac Township, around the area of Grosenbach Road. William Blanchard’s “rude habitation” is said to have been built in 1822 on land that later was included in the farm of Jacob Ames. One year before Blanchard came to the future Tazewell County, North Carolina native Nathan Dillon (1793-1868) brought his family overland from Ohio to Sangamon County, first dwelling on Sugar Creek south of Springfield. Dillon then struck out north, arriving in the future Tazewell County in 1823. Dillon has traditionally been called Tazewell County’s first white settler, but he arrived here a year after Blanchard and long after the Frenchmen of Opa Post. The confusion arose from the haste with which Chapman’s 1879 Tazewell County history was compiled and edited – Chapman didn’t learn that Blanchard preceded Dillon until the printing of his book was underway, so Chapman’s book at first states that Dillon was the earliest, then later on corrects and apologizes for that error. The monument at Dillon’s grave erroneously pronouncing him the county’s first white settler stems from Chapman’s mistake. But regardless who was first, Blanchard and Dillon both possessed pioneering courage and grit, paving the way for many others who were soon to follow. Next week we’ll review the story of the creation of Tazewell County. Here’s a chance to read again one of our old Local History Room columns, first published in April 2013 before the launch of this blog . . . Among the books in the Pekin Public Library’s Local History Room collection are a few histories of local communities in or near Tazewell County. Of that sort of publication, one recent addition to our collection is Vivian Higdon’s 116-page “Pieces From Our Past: Creve Coeur 1680-1998,” a gift to the library from Tyler Chasco. This week we’ll look back at Creve Coeur’s past with the help of Higdon’s book. As noted in this column about a year ago, Creve Coeur is best known for its ties to Fort Crevecoeur, which was built by French explorer Rene Robert Chevalier de La Salle in January 1680. Consequently, Creve Coeur can boast a history much longer than any other Tazewell County community. That’s not to say that the modern Village of Creve Coeur has an unbroken history tracing back to 1680, of course. It was not until May 5, 1921, that community voted to incorporate as the Village of “Crevecoeur.” Later, as Higdon explains, Mayor Carroll Patten in 1960 petitioned to have the official spelling of the village changed to “Creve Coeur,” because he believed “Crevecoeur” was a misspelling. The village’s name was chosen because it included the site that traditionally was believed to be where La Salle’s stockade fort had briefly stood. Others doubt they had correctly identified the fort’s location, and Dan Sheen of Peoria in 1919 offered compelling arguments that the correct spot was a site in what is today East Peoria. Despite the contending theories of historians and archaeologists, the story of Fort Crevecoeur is integrally connected with Creve Coeur’s history and heritage, which is commemorated through Fort Crevecoeur Park and the events held there each year. 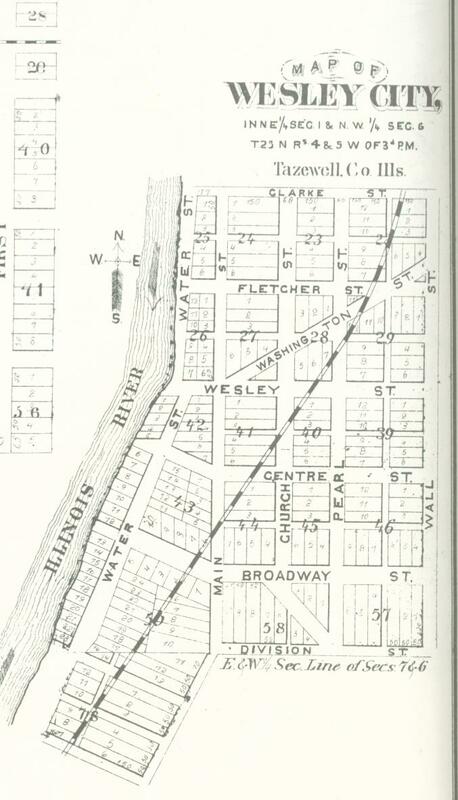 Prior to the incorporation of Crevecoeur, the community was known as Wesley City, an unincorporated settlement on the Illinois River which was first platted in 1836. An echo of the name of Wesley City lingers on in the name of Creve Coeur’s Wesley Road that tracks the riverfront. With the shifting of the Illinois River over the years, however, most of the streets of the original Wesley City are today submerged. This detail from the 1873 Atlas Map of Tazewell County shows Wesley City, former name of Creve Coeur. Most of the streets shown on this map are now under water. Wesley City had grown up near the site of an old French trading post which was built around 1775, nearly a century after La Salle’s ephemeral fort. Among the French Catholic fur traders who lived and worked there were Toussant Tromley and Louis Buisson (or Besaw), “both of whom were well-known to some of the pioneers” of Tazewell County, according to Charles C. Chapman’s 1879 history of the county. The trading post at Wesley City, located about three miles south of the Franklin Street Bridge, carried on a prosperous business with the Native Americans and white settlers until Pekin and Peoria established themselves, after which the old fur trade dwindled away. Also called “Opa Post” or Trading House, the log building was the home over the years to several French families, some of whom took Native American wives. When the State of Illinois expelled all the Indians after the 1832 Black Hawk War, some of these intermarried French-Indian families left Tazewell County and accompanied their Native American kin to reservations in Kansas. In the meantime, a Methodist preacher named Phillips and a few other settlers built a grist and sawmill near the trading post, which led to the founding of the community that they named Wesley City, after the Methodist leader John Wesley. Around that same time, the Rusche family arrived in Illinois from Alsace-Lorraine and settled in Wesley City. Over the generations, the Rusches had a prominent role in the development of their community, and their place in the history of Wesley City/Creve Coeur is commemorated with the naming of Rusche Lane.